NEJM에 실린 cirrhosis guideline과 Resident E-bulletin을 소개합니다. 제가 꾸준히 구독하는 e-mail 교육자료 중 하나는 NEJM Resident E-bulletin입니다 (무료). www.nejm.org에 등록하면 매주 받아볼 수 있습니다. 이번호 NEJM은 cirrhosis 치료를 다루고 있습니다. In patients with compensated cirrhosis, the 10-year probabilities of ascites, hepatic encephalopathy, and gastrointestinal bleeding are 47%, 28%, and 25%, respectively. These are ominous landmarks; 15% of patients who receive a diagnosis of ascites die within 1 year, and 44% within 5 years. What are some of the medications that should be avoided, and some that may be used, in patients with cirrhosis? Because of the risk of acute renal failure and gastrointestinal bleeding, nonsteroidal antiinflammatory drugs are contraindicated, except for low-dose aspirin in patients in whom the severity of cardiovascular disease exceeds the severity of cirrhosis. A large, placebo-controlled study involving patients with cirrhosis and ascites showed that although satavaptan alleviated hyponatremia, mortality was higher among patients with recurrent ascites who were receiving satavaptan than among those who were receiving placebo. Because of these findings as well as hepatotoxicity reported with respect to tolvaptan, the use of vaptans in patients with cirrhosis and ascites is not recommended. 3-Hydroxy-3-methylglutaryl coenzyme A reductase inhibitors (statins) can be safely started and continued in patients with cirrhosis. Acetaminophen is effective and safe in patients with liver disease, provided that the patient does not drink alcohol. When can paracentesis be safely performed in a patient with cirrhosis and coagulopathy? Paracentesis is relatively safe, even in patients with marked coagulopathy, including an international normalized ratio as high as 8.7 and a platelet count as low as 19,000 per cubic millimeter. It is important not to delay paracentesis in patients with suspected spontaneous bacterial peritonitis. One study showed that diagnostic paracentesis that was performed within 12 hours after the time of first encounter with a physician was associated with increased short-term survival rates. Delayed paracentesis was associated with a risk of death that was 2.7 times as high as the risk associated with early paracentesis. Each hour of delay was associated with a 3.3% increase in in-hospital mortality. What does the "window hypothesis" postulate about the use of beta-blockers in patients with cirrhosis? Non-selective beta-blockers reduce portal pressures and are used in the primary and secondary prophylaxis of variceal hemorrhage. However, various studies caution the use of beta-blockers in situations such as decompensated cirrhosis with refractory ascites, spontaneous bacterial peritonitis, and severe alcoholic hepatitis. These studies led to the “window hypothesis,” which postulates that beta-blockers are associated with higher rates of survival only within a clinical window. In patients who have early cirrhosis without moderate-to-large varices, beta-blockers do not prevent the development of varices and also result in adverse effects. The clinical window opens when moderate-to-large esophageal varices develop, with or without variceal bleeding, and beta-blockers are indicated for primary and secondary prophylaxis of variceal bleeding. Increasingly, evidence suggests that the clinical window for beta-blockers closes and that they are no longer effective when refractory ascites, hypotension, the hepatorenal syndrome, spontaneous bacterial peritonitis, sepsis, or severe alcoholic hepatitis develops, owing to unfavorable hemodynamic effects in advanced cirrhosis. The “window hypothesis” postulates that beta-blockers increase the survival rate only within a clinical window. In patients who have early cirrhosis without moderate-to-large varices, beta-blockers do not prevent the development of varices and may result in adverse effects. The clinical window for beta-blockers opens when patients have moderate-to-large esophageal varices with or without variceal bleeding,and beta-blockers are indicated for primary and secondary prophylaxis of variceal bleeding. 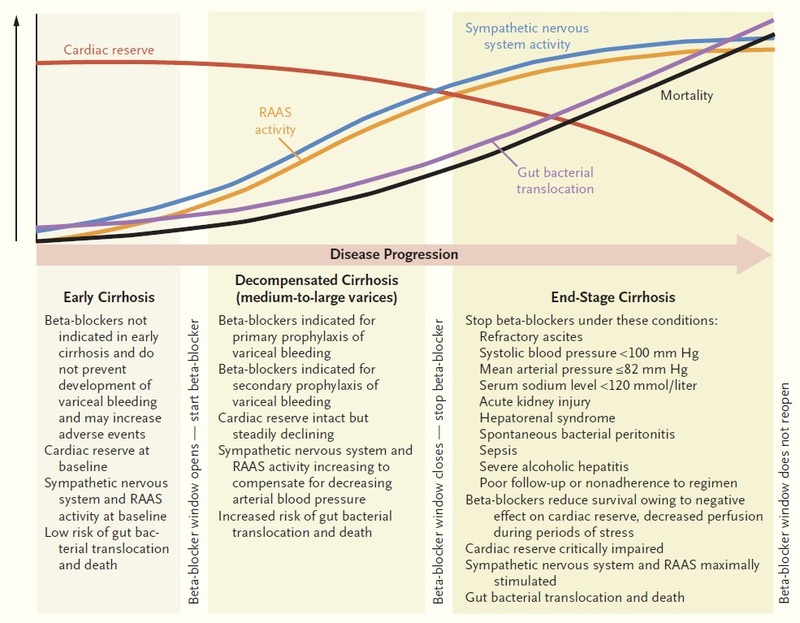 The clinical window for beta-blockers closes when patients have refractory ascites, hypotension, the hepatorenal syndrome, spontaneous bacterial peritonitis, or sepsis, owing to unfavorable hemodynamic effects in advanced cirrhosis. RAAS denotes renin-angiotensin-aldosterone system. What are some guidelines regarding the use of antihypertensives in patients with cirrhosis? Patients with cirrhosis who have a history of hypertension gradually become normotensive and eventually hypotensive as cirrhosis progresses. Studies of blood pressure in patients with cirrhosis and ascites showed that a mean arterial pressure of 82 mm Hg or less was the single variable that was most strongly correlated with a reduced probability of survival. The probability of survival among patients with a mean arterial pressure of 82 mm Hg or less was 20% at 24 months and 0% at 48 months, as compared with 70% at 24 months and 50% at 48 months among patients with a mean arterial pressure of more than 82 mm Hg. In a similar study, hypotension with a cardiac index below 1.5 liters per minute per square meter of body-surface area predicted the development of the hepatorenal syndrome and decreased survival among patients with cirrhosis and ascites. Because of these hemodynamic changes, antihypertensive agents should be discontinued in patients who have decompensated cirrhosis with ascites or hypotension.